I have been spoiled. Returning to my life of box mac and cheese is very, very bittersweet. While I was here, Tierney and Jeff have taken me to their favorite places and I’ve eaten some ridiculous food, which deserves it’s own blog post. The Sunday I flew in, we walked over to J. G. Melon’s, where we all had burgers. My turkey burger was faaantastic, T and Jeff had regular cheeseburgers. After work, we all walked a few blocks over to Atlantic Grill. It always astounds me how many tables restaurants can fit into veeery limited spaces, and this place was no exception. We started off with split pee and arugala gazpacho, which was poured over salmon and cherries. Sounds weird, came to the table looking a little weird (lime green! ), but it was one of my favorite things I ate this trip. For dinner, we all got different sushi rolls and shared. My second day in the office, I went to Juice Advertising for a workshop on marketing Acorda’s newest drug, Ampyra. When we were let loose around three, I went exploring through the meat packing district. I ended up at David’s Tea for a pick me up, and I had dinner at Corner Bistro which was highly rated on Zagat. It was super simple, the menu offered: chicken sandwich, burger, cheeseburger, chili, and fries. My chicken sandwich was darn good. One night after work, I joined a bunch of my coworkers and we went to The Cookery for a piggy roast. I wrote about it here, but let me reiterate how good the food was. 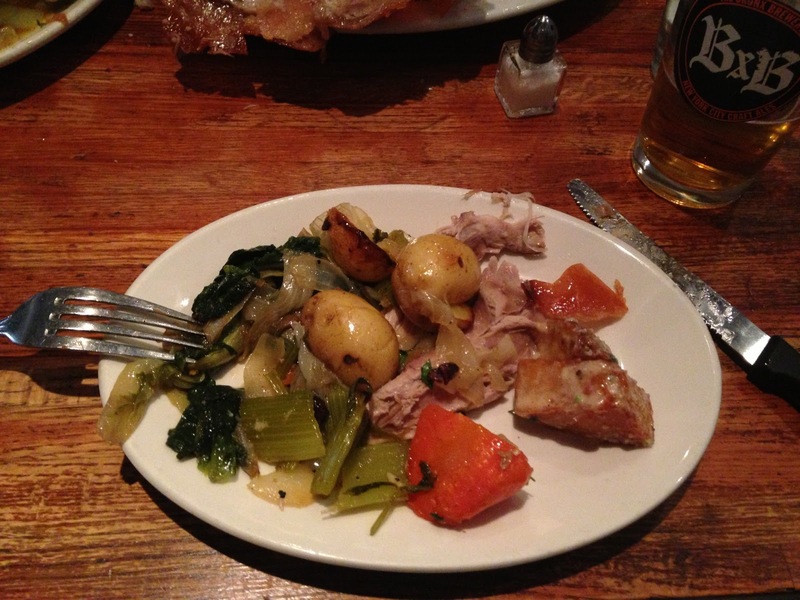 I was a little squeamish about the pork, but the vegetables, potatoes, and frrrrried potatoes, were fantastic. 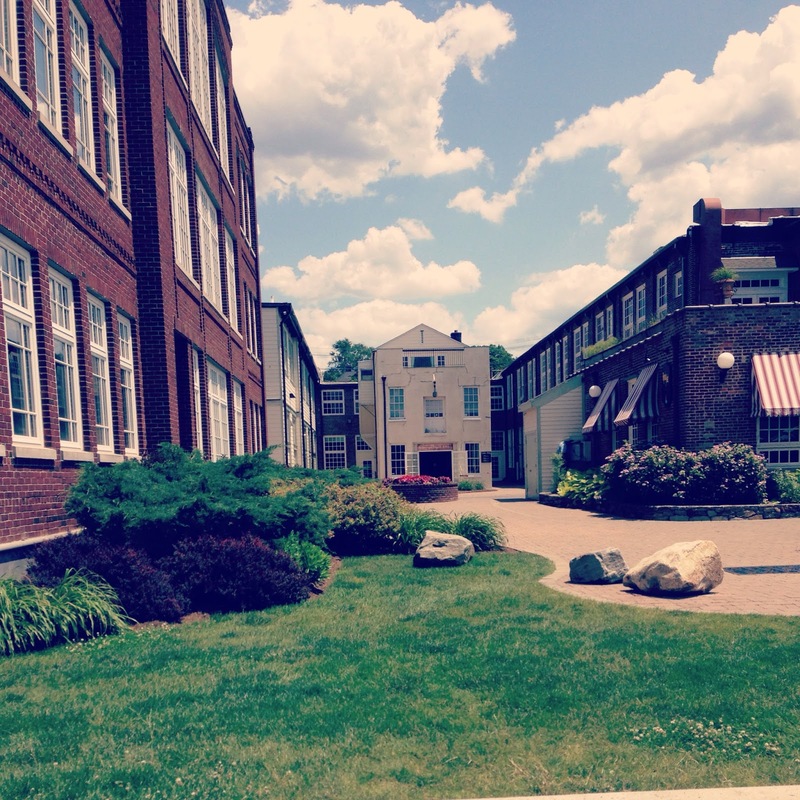 The first week I was here was rainy rainy rainy. I still carry my baby umbrella with me, because that first week was so horrific that I must be prepared at all times. 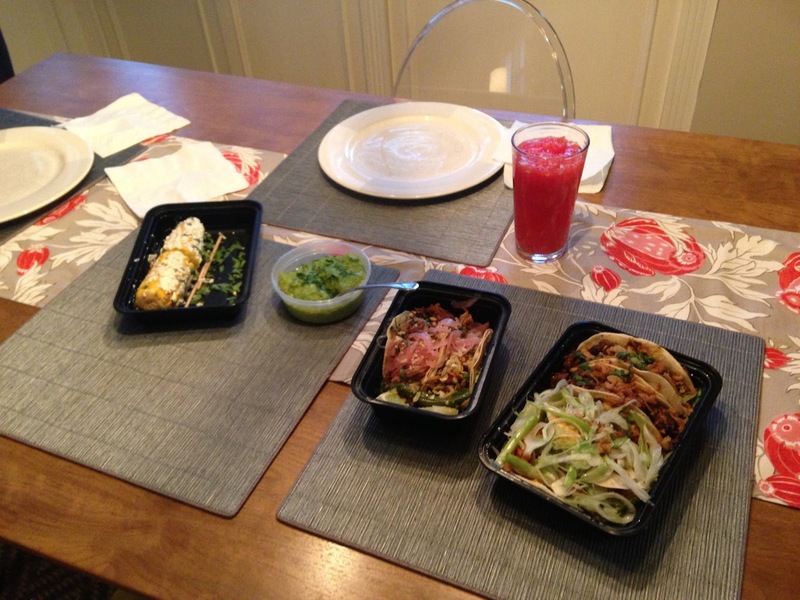 One particularly dreary night, T and I ordered from a place called Cascabel Taqueria. We had guac, roasted corn, steak, chicken and carnitas tacos. But most delicious was the watermelon aqua fresca, which I’ve been attempting to recreate ever since. The next morning, Sunday, I went for a run and then met T and Jeff at the T-Bar Steak & Lounge for brunch. We all had salads, I had a Cobb, T had a tuna salad, and Jeff had a caesar. Super fresh, tasty, and mine had really crispy bacon; which is basically the way to my heart. 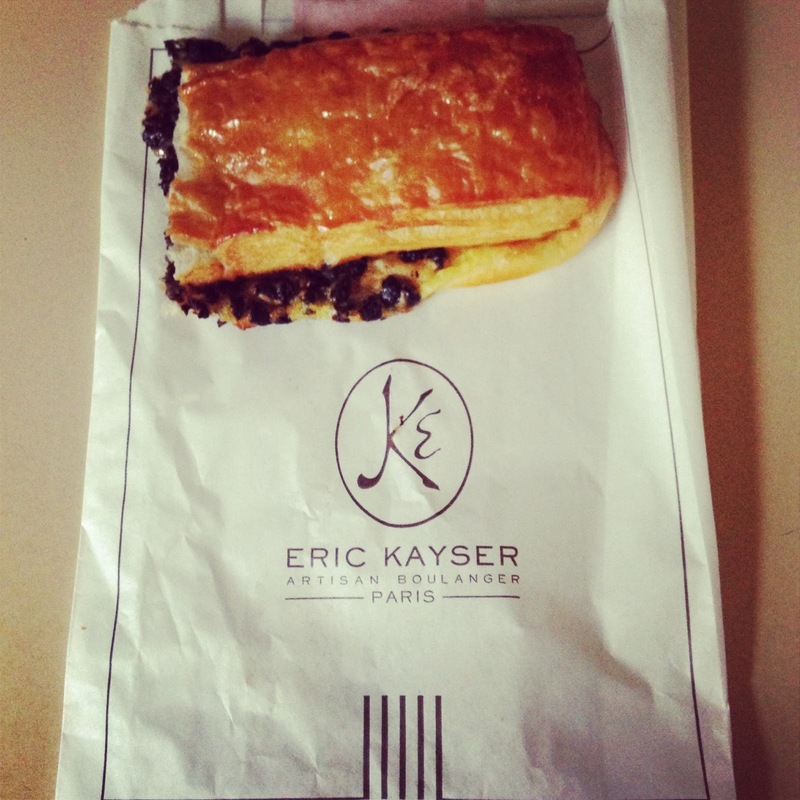 On our walk home, we stopped in Kayser to grab a loaf of bread and some iced coffees. 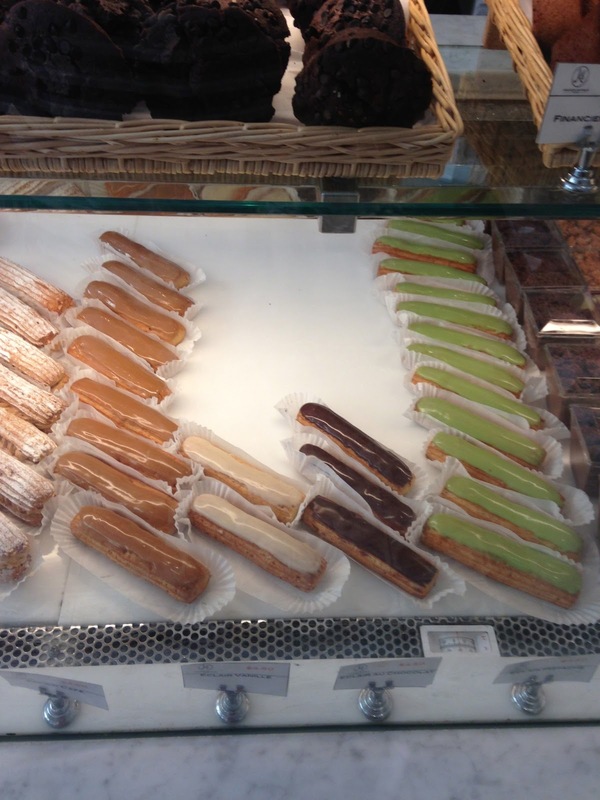 And some eclairs. 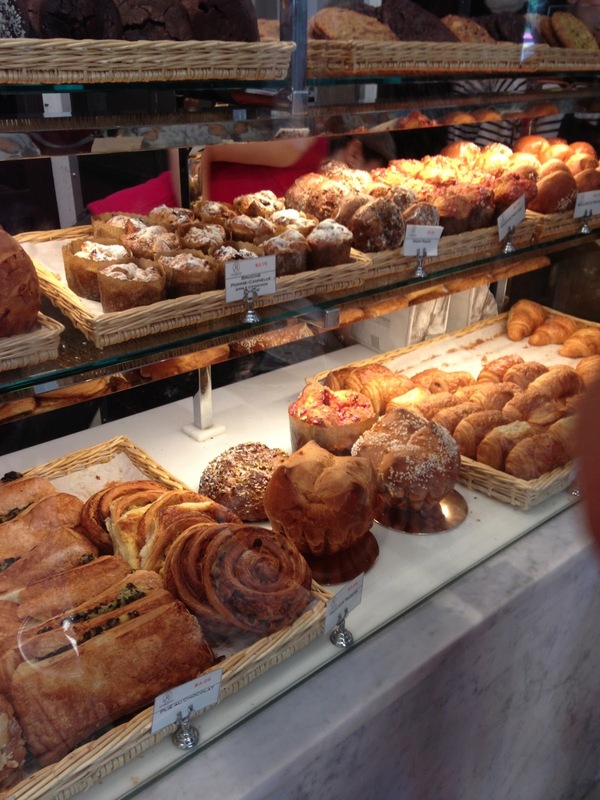 And some other delicious french things. Then I ate this chocolate croissant for breakfast earlier this week. 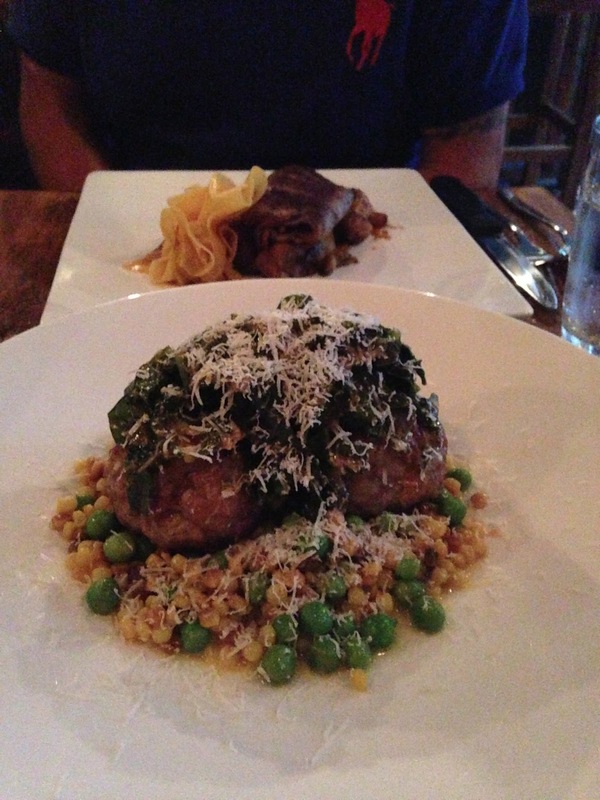 That night, we went over to Joe Doe in the East Village for dinner. The couple that run the restaurant are friends of T and Jeff, and they’re getting married soon! Jill and Joe run the place, and it is the best meal I had here in New York. Hands down. We ordered split pea gazpacho and gin scallops to start, and while Jill filled us in on the wedding details (eeee!) we feasted. Joe was on Chopped (and won!) 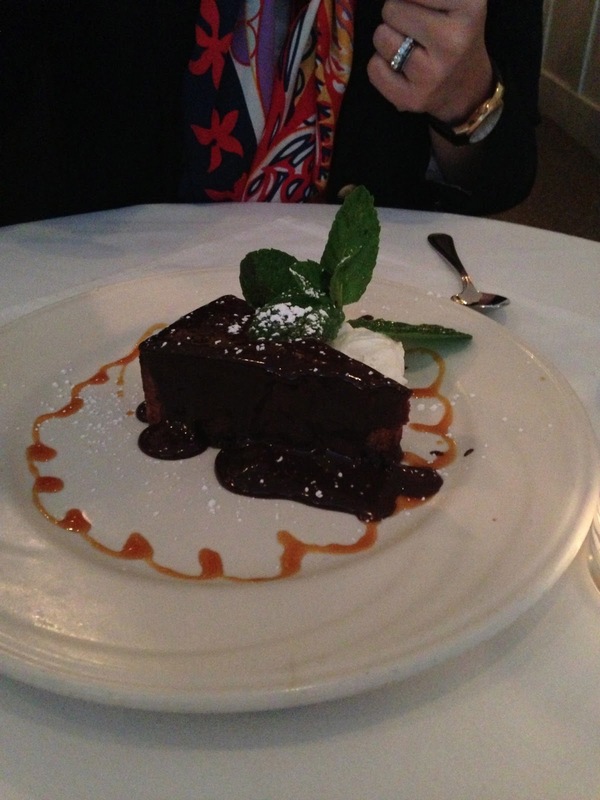 and he features his winning dessert on the menu. 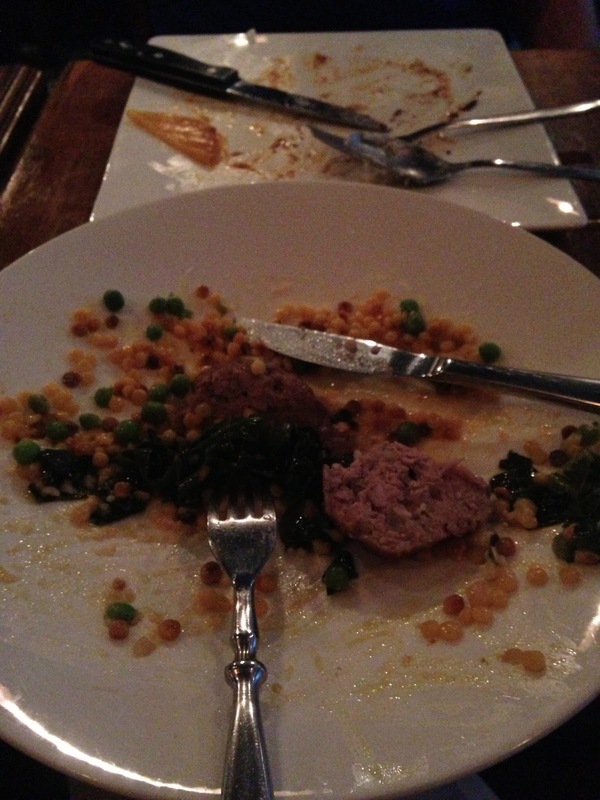 I had meatballs – and I can’t remember what T and Jeff had. I was that engrossed in my food. We finished with a banana bread sundae. So. Delish. before and after I attacked my dinner. Monday was the start of week two, and we had some really good chili. Jeff is a fantastic cook, his food is always healthy and flavorful. Other Jeff creations were chicken lettuce wraps with asian slaw, mushroom and asparagus risotto, and curry cous cous. The man has talent. Mid-week, we went to the Christopher Reeve Benefit at the Standard Hotel in the East Village. Before the event, we grabbed dinner at La Cerveceria. The peruvian style food was recommended, and we ordered a few small plates. Peruvian ceviche, ecuadorian ceviche, steak skewers, empanadas and patatas fritas. I hate to be critical… but it just wasn’t that good. The ceviches were really lime-y. But the sauces that the patatas and the steak skewers came with were ridic. As the week went along, the rain literally never left. One night after work, T had a doctor’s appointment and so Felicia and I took this opportunity to eat while we waited :) We went to Red Eye Grill and had wine and appetizers while we waited for T. When she joined us, we ended up eating crunchy tuna rolls, shrimp cocktail, and calamari. On top of the delicious house peppermint bark that they brought around to us. T and Jeff went to Chicago for an event, so I stuck to myself and ate chili for a couple nights. Stuffs good. They have a great grocery store a block away, called A Matter of Health where I’d walk down and get ice cream a couple nights a week. Lactose free ice cream isn’t bad. Not good, but not bad. I took Friday off from work to go exploring. While I was wandering through Central Park, I stumbled upon the Rogue Tomate cart, and was really surprised to see a bison burger on the menu for a little cart. Not the usual hot dogs and pretzels you find in these carts. I ordered a bison burger, which came with homemade apple ginger orange juice (!!!) and beet gazpacho. If you can’t tell.. I love gazpacho. 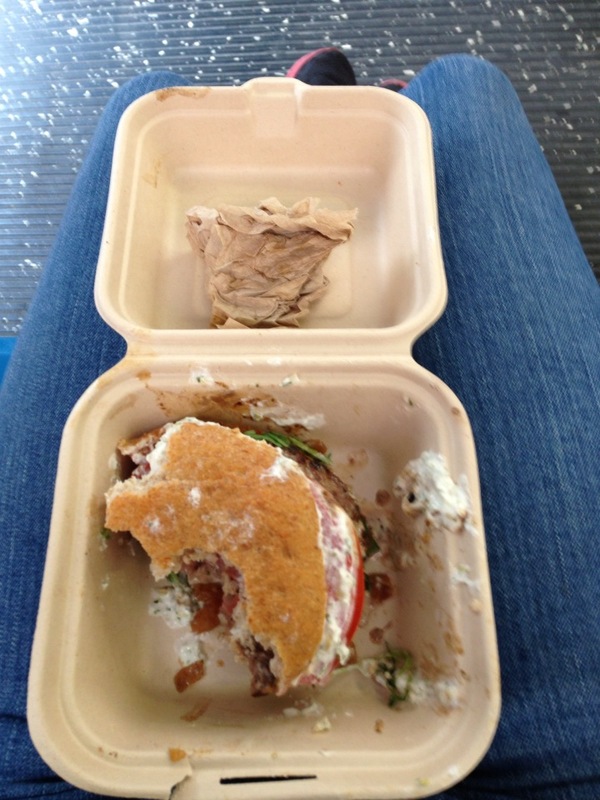 I (messily) ate my burger on the busride home. Does that make me impatient? Not waiting the fifteen minute bus ride home? It was good. I couldn’t wait. Saturday night, Tierney, Jeff and I went to go see This is the End (which was… alright) and afterwards we went to Celeste for dinner. I had potato gnocchi, and it was DISGUSTINGLY GOOD. I know, I keep saying everything was good, but it really was. After living in the city for twenty years, T knows what’s good. 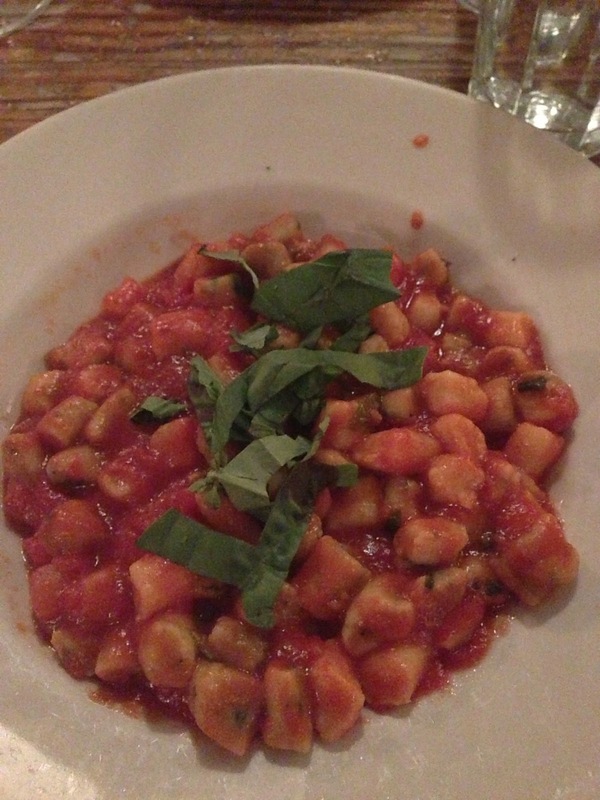 Anyway, above is the beautiful bowl of gnocchi I had. We all split a marinara pizza for an appetizer, which is the way my grandpa used to order his pizza, no cheese. My last week in the city was winding down and Tuesday night we decided to have our final girl dinner at Lavo. I’d heard about their meatballs from Jeff, so we ordered one as an appetizer. It was huge. I ate a fourth of it and I could have gone to bed happy. Felicia got salmon oreganatta, T had eggplant parmesean, and I had chicken marsala. The portions were ridiculously large, I had dinner that night and lunch the next day at work. Which brings me to the Acorda Cafeteria. For a cafeteria… it’s pretty darn good. They had a cute little guy in a sushi booth one day, pretty good soups, sandwiches, and salad bars. A couple times I went to the deli near Acorda with Yvette and Erica. I had lunch with Maria and Ebby at Umami Sushi Bar a couple times – where I had the most sushi for the littlest amount of money. And it was good sushi. I had four rolls for twelve dollars, with ginger salad and miso soup. For our final lunch on my last Thursday at work, we went to Red Hat on the River. Perfect weather and a delicious steak and blue salad makes me a happy Kate. Our last “family” dinner was Wednesday night. They took me to Hospada, which is a Czech restaurant a block over from their apartment. They started us off with pickled watermelon and gazpacho and czech beer, which they serve different ways. It’s the same beer, served four ways – each has a varying amount of foam. The samples they gave us were literally all foam. We all had gazpacho to start, then I had black quinoa and roasted veggies for dinner. T had scallops and Jeff ended up with halibut. Then we had fried cherries for dessert… which were served in a cherry cola foam and it was SO GOOD. Really unconventional, but good. My last night in the city was supposed to be uneventful. We left Acorda at the usual time, and we were heading home when we hit major traffic. We got off in the Bronx and decided it’d be easier to just drive across town than wait for traffic to clear up on the FDR. Poor life choice. We sat in traffic forever. We were just gonna go home and eat leftovers, and pack my bags. 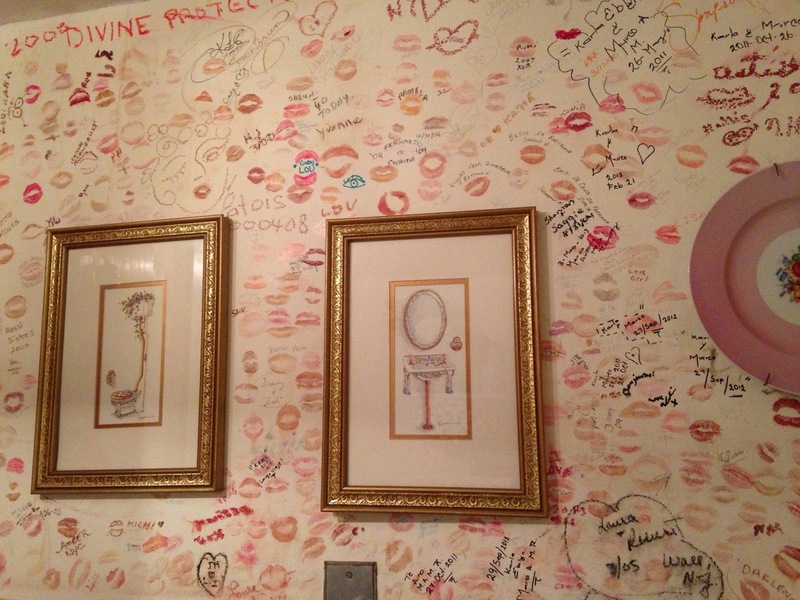 But then, Tierney decided we’d go to the Red Rooster in Harlem. If you ever watch Food Network, this is Marcus Samuelsson’s restaurant. In fact, he was sitting out on the patio eating when we were there! 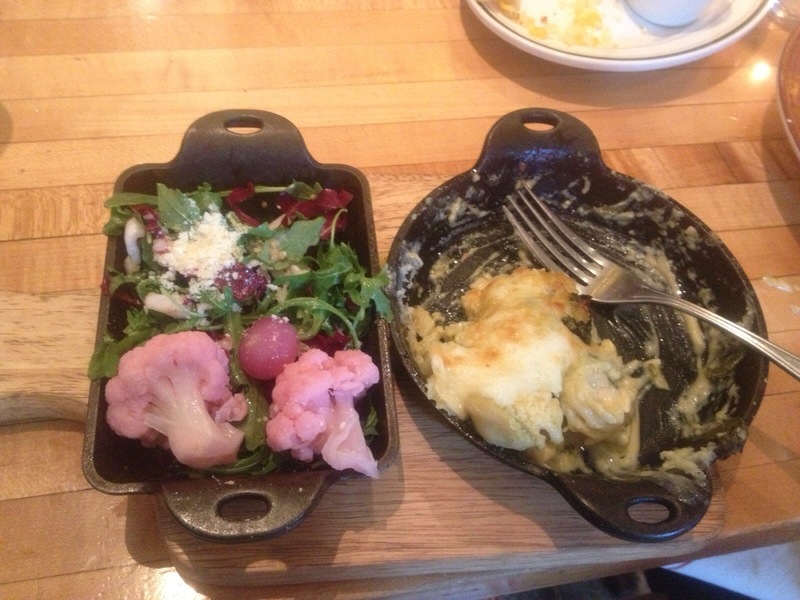 We were seated in no time, and I was eating Gouda and Greens before I knew it. I had my gouda mac and cheese, Felicia had chicken, and Tierney had the yard bird, which is what they call fried chicken. DELICIOUS. and that, is the end of my food expeditions in the city. my life of boxed mac and cheese is back in full swing and really, really, sad.